You could mix up pretty much any veggies with some corn and call it succotash. Traditionally it was made with lima beans but in some places they use kidney beans. So I had some corn and green beans in the fridge - guess what I made? Hell ya, succotash. It's just fun to say really. Succotash. I fattened this one up a little with the cream - but you could skip the liquids and it would be fine, not to mention just a little lower in fat! I found this made a nice side dish to some grilled steak; but I think if you added some hunks of turkey, chicken or even spicy sausage - it could be a meal. Serve with a hunk of bread and you'd be set. Moral of the story? 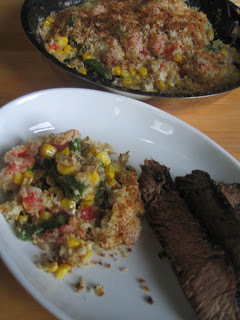 Sautee some veggies in butter, maybe add a crust and you've got a fat and happy succotash. Sautee the onion in the butter and oil until slightly soft. Add the garlic, the beans and the corn- sautee until the garlic is soft (about 3 minutes). Add the cream and the corn water (use plain water or broth if you don't have the corn water). Let that simmer until the liquid thickens. 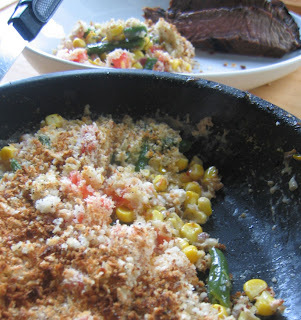 Then sprinkle the corn mixture with the tomato, goat cheese and the bread crumbs (and salt and pepper). Place the pan under the broiler until the bread crumbs brown. Allow to rest for a minute, then serve.